Reality TV has brought new opportunities for ever greater numbers of people to grab and extend their fifteen minutes of fame. The landscape of reality television has expanded since its advent in the early 1990s. From dating shows to makeover programs, talent contests to reality sitcoms (and celebrity versions of all of them), there are now multiple reality genres available to those seeking attention and notoriety. Everyone, often despite little talent, can market themselves and their identities to a wider audience. But what happens when your fifteen minutes of fame aren’t of your own choosing? More precisely, what if your parents choose to make you famous? Kids and reality TV are a growing—and volatile—mix. Throughout 2009 it was difficult to escape news coverage of “reality families” like Jon and Kate Gosselin and their brood of eight, “Octomom” and her dozen-plus, and the almost universally reviled Heene family who convinced their children to lie about a balloon stunt designed to help them secure their own reality show. But the media don’t often talk about children and reality TV as a genre—or the economic, legal, and psychological consequences of the pairing. One of the first examples of kid-centered reality TV was Bug Juice, shown on the Disney Channel in the late 1990s. The series, which aired for two seasons, followed a group of adolescents at sleep-away summer camp, documenting their friendships, crushes, and heartbreaks. The show aroused little to no media attention, presumably because of the positive gloss of the Mouse Network. Fast forward about ten years to CBS’s Kid Nation, which definitely produced an outcry. Kid Nation focused on 40 children, ranging from eight to fifteen years old, who were thrown together in a deserted town in New Mexico and told to create their own society, without “adults.” Media watchers railed about the safety and education of the children, given that the show was filmed during the school year and some of the kids were injured while cooking and working in their “society.” Entertainment insiders, like Paul Peterson of the non-profit A Minor Consideration, an organization focused on protecting young “performers,” highlighted issues of compensation, contractual obligations, and the labor the children contributed to this television show. As most critics pointed out, it was no accident that Tom Forman Productions selected New Mexico as the site of the show, as at the time it had very lax child labor laws, which have since been revised. A second season was called off amid criticism and less-than-stellar ratings. These issues surrounding the exploitation of children featured on reality television became part of the public discourse in a tragicomic way with the highly publicized reality TV show Jon & Kate Plus Ei8ht. In 2007, Figure 8 Films shot a documentary about the Gosselin family—a mom and dad, their twin daughters and their sextuplets (three boys and three girls)—that first aired on the Discovery channel. Subsequent specials were so popular that the cable channel TLC made it into a weekly show that aired for five seasons before being canceled in 2009 amidst family turmoil and concerns about the children’s well-being. Kate’s tantrums and odd hair, Jon’s behavior, the children’s personalities, the freebies the family received (including a tummy tuck and hair plugs), and even the family dogs became tabloid fodder, water-cooler gossip, and dinnertime conversation. TLC had a bona fide hit with one of the highest viewed television shows on cable TV. The success of Jon & Kate showed how a cheap-to-produce reality show (eight of the ten “stars” weren’t individually compensated) could spawn an entire marketing franchise, complete with adult and children’s books, DVDs, and other products sold with the Gosselins’ names and faces. The family has been so effectively marketed and sold to the public that both Jon and Kate quit full-time employment to focus on branding their family and making as much money as they could. Presumably hoping to replicate their success, TLC developed other reality series featuring kids and their unique families like Little People, Big World, 18 Kids and Counting, and Table for 12. Enter the Heene family. Richard Heene met his wife Mayumi in a Hollywood acting school. A few years and three sons later they appeared on an ABC reality TV show called Wife Swap—not once, but twice. In 2009, Richard Heene pitched his own family to TLC as the subject of a reality series; he understood how lucrative, both in terms of fame and money, family reality shows had become, especially given the Gosselins’ experience. The now infamous “Balloon Boy” hoax of October 15, 2009, was an ill-conceived attempt to bring the family media attention and increase their chances of landing their own reality show. The youngest participant in the hoax, six-year-old Falcon, let the cat out of the bag on The Larry King Show. Not only will his slip, “You said we did this for the show,” live on through YouTube clips, but so will his appearance on The Today Show the next morning, when he threw up on live television (some speculated out of exhaustion, while others went so far as to suggest his parents had drugged him). For little Falcon, his fifteen minutes of tears and vomit will play out forever on the Internet—all in the service of his parents’ pursuit of fame and money, which instead ended in jail time. Of course, child performers have long produced outrage and concern. As sociologist Viviana Zelizer explains, in the efforts to eradiate child labor in the United Status during the Progressive Era, child actors presented a particular challenge. Many adults said that these little performers were not actually working since their theatrical experiences were educational and fun. Others, who wished to outlaw all child labor, countered that parents were simply taking advantage of their children and turning them into a business so they could live off of them. The compromise solution to this debate was to allow child actors to continue to work, but with restrictions both in terms of the number of hours worked and the compensation structure. The Coogan Law, passed in 1939, established that 15 percent of all earnings must be kept in a trust for child performers until they turned 18—this after child actor Billy Coogan’s parents left him penniless on his own 18th birthday. These restrictions remain in place today. However, because of the nature of reality television, children appearing on these shows are not, by law, considered performers or even laborers. This is actually true for almost all those who appear on reality shows, especially programs like Survivor and The Amazing Race, which are officially classified as game shows. One notable exception is American Idol,, where, once contestants reach the Top 12, they become members of the American Federation of Television and Radio Actors (AFTRA) and receive union compensation and protection. But the Coogan law and AFTRA protections do not apply to the little Gosselin children, or the Duggars, the Roloffs, or other kids providing storylines and images which line the pockets of their parents and television executives. While there have been attempts to introduce Coogan-type legislation federally and in Pennsylvania, where Jon & Kate Plus Ei8ht was filmed, they have not been successful (note that Nadya Suleman, aka “Octomom,” does have Coogan accounts for her children, because the as-yet unaired reality show about her family is being filmed in California, which has the strictest Coogan laws). It’s clear that the Gosselin children worked long hours, often under poor conditions; a clip of one of the older Gosselin girls begging for, and being denied, water during a press junket for the series made headlines and became a viral clip. Not surprisingly, given their long work hours, the Gosselin kids often missed school. The media reported that in order to capitalize on the paparazzi attention around Jon and Kate’s marital woes, Figure 8 paid for Kate and the kids to vacation in the Outer Banks, where the children missed many of the last days of the school year. On top of this, while there are trust funds for the children, that money can be accessed by their parents at any time—and, unfortunately, the new house and cars purchased by Jon and Kate suggest that the kids’ college funds may not be as large as they could be. Overall, it is unclear who is protecting the needs and rights of children like the Gosselins when it comes to reality television. It’s also important to think about how reality TV forces its child stars to perform exaggerated versions of themselves to please their parents and other adults. 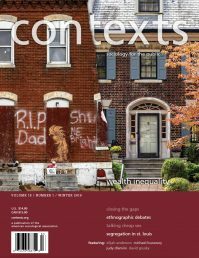 Given parents’ apparent willingness to allow others to edit and shape their children’s “real” identities for a larger public in pursuit of status and financial benefits—even the greatest child star of all time, Shirley Temple, only ever played fictional characters—how might reality TV participation impact the kids’ on- and off-screen presentations of self? In a sense, parents are taking away their children’s ability to shape how others will see them, both now and in the future. Falcon Heene will probably always have the stigma of being “Balloon Boy” and getting sick on national television. Yet producers seem to have no problem finding parents to sign waivers allowing their children to be on shows like Kid Nation, Bravo’s NYC Prep, or even a VH1 competitive reality show whose title says it all: I Know My Kid’s a Star. It’s also interesting that, for the most part, these reality shows are not packaged for children’s consumption. Instead, they’re largely produced for an adult audience, an audience which, of course, includes the parents themselves. It appears that 2010 will only extend the reign of children on reality TV. Mark Burnett, the man who created Survivor, developed a game show for Fox featuring kids and their parents called Our Little Genius. The New York Times reported on January 6, 2010, that the show would give kids the chance to “win life-changing money for their families” by answering trivia questions correctly. (The next day, the AP reported that the show had been pulled because producers discovered some improprieties, presumably with parents feeding answers to their kids.) The long-standing NBC series Law & Order has also weighed in on parents’ over-zealousness to use their children to get their own fifteen minutes of fame in an episode entitled “Reality Bites,” which aired in October 2009. The episode featured a husband who killed his wife because she refused to sign the waivers allowing their children to appear on a reality show. The wife’s character had voiced concerns over the kids’ portrayal and how their friends would see them now and in the future—and, of course, suspicion about her murder first fell on an Octomom rip-off who was competing for a reality series on the same network. The timely episode and all of these reality shows raise questions that’ll remain unanswered for years: Will these kids be proud of the fifteen minutes they got at age five? Will they resent their parents for exposing their potty training to a general public? How will this notoriety affect their own views of themselves and how they present themselves to others in public? Let’s just hope that some of the profits that have been earned off of these children’s on-camera performances will be there for therapy, or at least a getaway car, if either proves necessary for the next “big” little reality stars someday. Listen to the Contexts Podcast for an upcoming interview with Hilary Levey!